4. Laser Spine & Pain Institute, New York, NY, USA. Study Design: A randomized, active control, double-blind trial. Objective: To evaluate the effectiveness of fluoroscopically directed caudal epidural injections with or without steroids in managing chronic low back and lower extremity pain secondary to post lumbar surgery syndrome. Summary of Background Data: There is a paucity of evidence concerning caudal epidural injections for managing chronic persistent low back pain with or without lower extremity pain caused by post lumbar surgery syndrome. Methods: This active control randomized study included 140 patients with 70 patients in each group. Group I received 0.5% lidocaine, 10 mL; Group II received 9 mL of 0.5% lidocaine mixed with 1 mL of 6 mg of nonparticulate betamethasone. The multiple outcome measures included the numeric rating scale, the Oswestry Disability Index 2.0, employment status, and opioid intake with assessments at 3, 6, 12, 18, and 24 months posttreatment. Primary outcome was defined as at least 50% improvement in pain and Oswestry Disability Index scores. Patients with a positive response to the first 2 procedures with at least 3 weeks of relief were considered to be successful. All others were considered as failures. Results: Overall in Group I, 53% and 47% of the patients and in Group II, 59% and 58% of the patients, showed significant improvement with reduction in pain scores and disability index at 12 months and 24 months. In contrast, in the successful groups, significant pain relief and improvement in function were observed in 70% and 62% of Group I at one and 2 years; in 75% and 69% of Group II at one and 2 years. The results in the successful group showed that at the end of the first year patients experienced approximately 38 weeks of relief and at the end of 2 years Group I had 62 weeks and Group II had 68 weeks of relief. Overall total relief for 2 years was 48 weeks in Group I and 54 weeks in Group II. The average procedures in the successful groups were at 4 in one year and 6 at the end of 2 years. Conclusion: Caudal epidural injections of local anesthetic with or without steroid might be effective in patients with chronic persistent low back and/or lower extremity pain in patients with post lumbar surgery syndrome. Keywords: Chronic low back pain, post lumbar surgery syndrome, recurrent disc herniation, epidural fibrosis, spinal stenosis, caudal epidural steroid injections. The increasing prevalence of chronic low back pain, which is associated with exploding diagnostic and therapeutic modalities and a disproportionate increase of health care expenditures, is a major health policy issue in the United States and across the world [1-15]. Apart from multiple conservative modalities of treatments and interventional techniques, surgical interventions have been performed extensively for intervertebral disc herniation, spinal stenosis, and degenerative spondylolisthesis with stenosis [10,12,16-19]. Comparative effectiveness evidence from the Spine Patient Outcomes Research Trial (SPORT)  showed significant improvement in patients who had surgical interventions compared to conservative treatment modalities. The SPORT trial also showed a reoperation rate of 4% at one-year, and 10% at 4 years. Further, the literature is replete with numerous evaluations illustrating a 9.5% to 25% reoperation rate [19-28]. Martin et al , in a recent report, showed a mean reoperation rate of 6.1% at one-year, and 13.2% at 4 years, higher than the SPORT reoperation benchmarks. Deyo et al , in a report of revision surgery following operations for lumbar spinal stenosis, showed that the probability of repeat surgery at 4 years was 10.6% to 17.2%. Multiple causes shown for revision surgery in these reports were related to herniated disc, stenosis, disc degeneration, spondylolysis, spondylolisthesis, and scoliosis [29,30]. However, multiple other causes not requiring repeat surgery, or managed by interventional techniques that are responsible for continued persistent pain and disability include epidural fibrosis, sacroiliac joint pain, disc herniation, discogenic pain, spinal stenosis, and facet joint pain [11,24-28,31,32]. Even though it is widely accepted that epidural fibrosis is a major cause of complications after lumbar spine surgery, the role of peridural scarring in recurrent radicular pain has been weighed and extensively debated . Ross et al  found that patients with extensive peridural fibrosis were 3.2 times more likely to experience recurrent radicular pain than those with less scarring. Experimental studies have provided electrophysiological evidence of neurologic disturbances caused by peridural scar formation . Further, it has been shown that epidural fibrosis in the vertebral canal by invasion may cause mechanical tethering of nerve roots [34,35] and disturbances in blood flow  and express pro-inflammatory cytokines, which may irritate exposed dorsal root ganglion (DRG) and trigger painful responses . Osteopontin also has been identified as a major player in the formation of epidural fibrosis and a mark-up DRG response to peridural scar formation . Consequently, epidural fibrosis may be a causative factor in at least 20% to 36% of all cases for failed back surgery syndrome [24-26]. Further, experiments in post lumbar laminectomy syndrome in animal models have illustrated paraspinal muscle spasms, tail contractures, pain behaviors, tactile allodynia, epidural and perineural scarring, and nerve root adherence to the underlying discs and pedicle [38,39]. Epidural steroid injections and adhesiolysis are two of the most commonly utilized interventions for managing chronic, persistent low back and/or lower extremity pain in post lumbar surgery syndrome resulting from various causes, including epidural fibrosis, spinal stenosis, recurrent disc herniation, and discogenic pain without evidence of facet joint pain, radiculitis, or sacroiliac joint pain [11-15,40-44]. However, the use of epidural steroid injections has been met with not only skepticism, but also has faced significant criticism for all indications due to an alleged lack of evidence by critics, whereas supporters have described it otherwise [11-15,40-57]. There has been justification for some of the criticism, specifically in managing post lumbar surgery syndrome due to lack of quality studies with paucity of evidence. Manchikanti et al  published one-year results of the effectiveness of fluoroscopic caudal epidural injections for chronic low back pain with post surgery syndrome which included 140 patients, 70 patients in each group receiving local anesthetic with or without steroids. Significant improvement in pain and function was illustrated. The current report describes a 2-year follow-up of the role of fluoroscopic caudal epidural injections in patients with chronic low back and lower extremity pain after surgical interventions with post lumbar surgery syndrome in 140 patients. The previous report of a one-year follow-up has been published . The current study was conducted with the Institutional Review Board (IRB) approved protocol and registered with the U.S. Clinical Trial Registry with an assigned number of NCT00370799. The study incorporated Consolidated Standards of Reporting Trials guidelines  in a private interventional pain management practice and specialty referral center in the United States. This study was conducted with the internal resources of the practice without external funding from either industry or elsewhere. One hundred and forty patients were recruited from a single pain management center and were assigned to one of 2 groups. The IRB-approved protocol and informed consent described in detail all aspects of the study and withdrawal process. Of the 140 patients, the 70 assigned to Group I received caudal epidural injections of local anesthetic (lidocaine 0.5%); the 70 patients assigned to Group II received caudal epidural injections of 0.5% lidocaine 9 mL mixed with 1 mL of nonparticulate betamethasone, 6 mg. A total volume of 10 mL (10 mL of lidocaine 0.5% or 9 mL of lidocaine with 1 mL of nonparticulate betamethasone), was injected, followed by an injection of 2 mL of 0.9% sodium chloride solution to flush the contents from the sacral canal. Pre-enrollment data collection included demographic data, medical, and surgical history with co-existing disease(s), radiologic investigations, physical examination, pain rating scores using the Numeric Rating Scale (NRS), functional status assessment using the Oswestry Disability Index 2.0 (ODI), work status, and opioid intake. Criteria for inclusion in the study included only patients with a history of chronic function-limiting low back pain with or without lower extremity pain of at least 6 months duration (post surgery), with the surgery performed at least 6 months earlier; over the age of 18 years; patients who were competent to understand the study protocol and provide voluntary, written informed consent and participate in outcome measurements; evidence of a lack of diagnosed facet joint pain and failure to improve substantially with conservative management including, but not limited to, physical therapy, chiropractic manipulation, exercises, drug therapy, and bedrest. Exclusion criteria included a positive response to controlled, comparative, local anesthetic blocks, uncontrollable or unstable opioid use, uncontrolled psychiatric disorders, uncontrolled medical illness, either acute or chronic, any conditions that could interfere with the interpretation of the outcome assessments, pregnant or lactating women, and patients with a history or potential for adverse reaction(s) to local anesthetic or steroids. A single physician (LM) performed the caudal epidural procedures in a sterile operating room at an ambulatory surgery center. All the procedures were performed under fluoroscopy, with patients in the prone position with appropriate monitoring and intravenous sedation with midazolam and fentanyl as indicated. The epidural space was accessed and confirmed by injection of nonionic contrast medium in a sterile fashion. This was followed by injection of the appropriate mixture as assigned. Participants received repeat caudal epidural injections if their first injection improved their physical and functional status. In addition, the repeat injections were given only when increased levels of pain were reported with deteriorating relief below 50%. Previous drug therapy, therapeutic exercise program, and work were all continued; however, there were no specific additional interventions given to any of the patients. Evaluation of the effectiveness of caudal epidural injections with or without steroids in managing chronic low back and lower extremity pain secondary to post lumbar surgery syndrome. The numeric rating scale (NRS) pain scale (0 - 10 scale), the Oswestry Disability Index (ODI) (0 - 50) scale, employment status, and opioid intake in terms of morphine equivalents were assessed at 3, 6, 12, 18, and 24 months posttreatment. The reliability of the NRS and ODI have been established [59,60]. A robust measure of improvement with significant pain relief and reduced disability status of 50% or more were utilized [41-44,61-69]. The opioid intake was converted into morphine equivalents . Categories for employment and work status included employable, retired, over age 65, or housewife with no desire to work outside the home. Participants who, because of pain, were unemployed, on sick leave, but employed or laid off, were considered as employable. Thus, only the employable patients were considered for employment eligibility. If a study participant received consistent relief with the first and second procedures, and at least 3 weeks with the first 2 procedures, the epidurals were considered to be successful; all others were considered failures. Due to the lack of trials for estimating the sample size for post surgery syndrome, the present sample size was based on significant pain relief in lumbar disc herniation. Considering a 0.05 two-sided significance level, a power of 80%, and an allocation ratio of 1:1, 55 patients in each group were estimated . Making allowances for a 20% attrition/noncompliance rate, 70 participants were determined to be required. Seventy patients were randomly assigned into each of the 2 groups. Computer generated random allocations sequence by simple randomization was utilized for sequence generation. Participant randomization and drug preparation were performed by the operating room nurse assisting with the procedure. Patients willing to participate and meeting inclusion criteria were enrolled and assigned to their respective groups by one of the 3 study coordinators. The physician who administered the interventions, as well as the participants, were blinded to the group assignments. Clear solution was administered in both groups. The blinding was assured by mixing the participants with patients receiving routine treatment and not informing the physician performing the procedures who was in the study. For testing the differences in proportions, chi-squared statistic was used. Wherever the expected value was less than 5, Fisher's exact test was used; a paired t-test was used to compare the pre- and posttreatment results of average pain scores and ODI measurements at baseline versus 3, 6, 12, 18, and 24 months. T-test was performed to compare mean scores between groups. A P value of 0.05 was considered as significant. Because the outcome measures of the participants were measured at 6 points in time, repeated measures analysis of variance were performed with the post hoc analysis. An intent-to-treat-analysis was performed. Either the last follow-up data or initial data were utilized in the participants who dropped out of the study and no other data were available. Using the last follow-up score, best case scenario, and worst case scenario, a sensitivity analysis with changes in the numeric pain scale was performed. The intent-to-treat analysis with last follow-up visit was used if there were no significant differences. The participant flow is illustrated in Figure 1. The recruitment period lasted from January 2007 to August 2009. Table 1 illustrates each groups' baseline demographic and clinical characteristics. Patients in Group I weighed more than Group II. Therapeutic procedural characteristics with average pain relief per procedure are illustrated in Table 2. The total number of procedures per 2 years was 5.7 ± 2.3 in Group I and 6.3 ± 2.2 in Group II for successful participants with relief of 62.1 ± 33.8 weeks in Group I and 67.8 ± 30.5 weeks in Group II. In contrast, in failed participants the number of injections per year was 1.3 ± 0.6 in Group I and 1.7 ± 0.8 in Group II with average relief of 2.4 ± 3.6 weeks in Group I and 2.2 ± 3.3 weeks in Group II. To be considered successful, the first 2 procedures had to provide at least 3 weeks of relief. Table 3 presents the results of repeated measures analysis. Regarding pain scores, there were significant differences within groups by time (P = 0.0000). In the Oswestry Disability Index for functional status, there were significant differences in summary scores within group by time (P = 0.000). A post-hoc analysis indicates that all the mean differences between baseline and with other time point's scores were significant at the 0.05 level. Figure 2 illustrates proportion of patients with significant reduction (≥ 50%) in NRS scores and ODI. Schematic presentation of patient flow at 2-year follow-up. Proportion of patients with significant reduction in Numeric Rating Score and Oswestry Disability Index (≥ 50% reduction from baseline). Baseline demographic and clinical data. Therapeutic procedural characteristics with average relief per procedure, and average total relief in weeks over a period of 2 years. Successful participant - At least ≥ 3 weeks relief with first 2 procedures. Comparison of Numeric Rating Scale for pain and Oswestry Disability Index score summaries at four time points. * Group by Time Interaction - There were no significant difference between groups at 3 months, 6 months, 12 months, 18 months and 24 months. Employment characteristics are illustrated 12 patients in Group I and 17 patients in Group II eligible for employment with 9 patients in Group I and 13 patients in Group II employed at baseline. At the end of 1 and 2 years, 13 patients were employed in Group I, whereas in Group II, 15 patients at the end of 1 year and 14 patients at the end of 2 years were employed, with employment available for all those who were eligible. Opioid intake (characteristics with increases and decreases illustrated decrease in intake from baseline in both groups, without changes among the groups. Changes in body weight are illustrated in Table 4. No major adverse events were reported over the 2-year study period in any of the 696 procedures performed in the140 participants. This relatively large, randomized, double-blind, active control trial of fluoroscopic caudal epidural injections with or without steroids in 140 patients with chronic, persistent low back and lower extremity pain secondary to post lumbar surgery syndrome showed clinically meaningful and significant improvement with pain and functional status at the end of one and 2 years. The results of this practical evaluation performed in a nonacademic private practice setting simulating practice patterns illustrates that in carefully selected patients, who do not have facet joint pain, those judged as successful participants (i.e., who responded to the first 2 procedures with at least 3 weeks of relief), combined pain relief and improvement in functional status was observed in 62% in Group I and 69% in Group II at the 2-year follow-up. Further, the overall improvement was also significant when all participants were included with 47% of the patients showing improvement in Group I and 58% of the patients showing improvement in Group II at the end of 2 years. Thus, this study confirms that caudal epidural injections in appropriately selected patients with post lumbar surgery syndrome are a successful modality for managing this chronic, recalcitrant condition. Further, the response was similar in patients receiving local anesthetic only or local anesthetic and steroid combination with nonparticulate betamethasone. There was no significant difference in the total relief over a period of 2 years with 62.1 ± 33.8 weeks in Group I and 67.8 ± 30.5 weeks in Group II in the successful groups. Further, the average relief per procedure for the initial 2 procedures, as well as subsequent procedures and overall procedures over the period of 2 years was similar in both groups of patients with respect to overall results. The average number of procedures at the end of one year was approximately 3.5 and after 2 years, the average number was 5 in both groups. However, in the successful groups, the number of treatments were approximately 4 and 6 at the end of one and 2 years. The literature is replete with multiple studies and systematic reviews in favor and against epidural injections [11-13,46-64,71]. Particularly, there are no studies evaluating the effectiveness of fluoroscopically directed caudal epidural injections under optimal conditions of contemporary interventional pain management practice in a large number of patients. Multiple studies have been criticized, most importantly for their design and their inability to confirm the location of the injectate by not using fluoroscopy [11,58,60,62,63,72-74]. Multiple systematic reviews have been criticized for their methodology by evaluating studies inappropriately, thus, reaching inaccurate conclusions based on inappropriate evidence synthesis [11-13,44-64,71,75]. 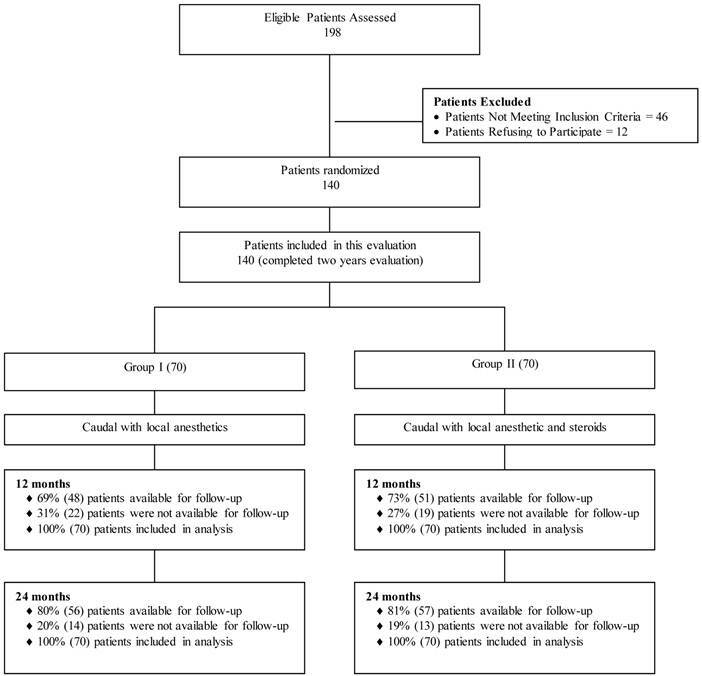 In a systematic review by Conn et al  of randomized and nonrandomized studies of caudal epidural injections for managing chronic low back pain of post-surgery syndrome along with other conditions, only one trial's preliminary data met inclusion criteria of long-term follow-up of at least 6 months along with the use of fluoroscopic visualization . They concluded that due to the paucity of literature, the evidence was Level II-2. However, other systematic reviews have combined multiple approaches into one category, with the majority of them performed blindly without fluoroscopy [11-13]. This study may be criticized for its lack of a placebo group. However, there are numerous difficulties related to having a placebo group in interventional techniques studies. Further, placebo experimentation has yielded highly variable results. This is because the injection of an inactive compound into an active structure was performed by those who lack an understanding of placebo and nocebo in clinical trials [75-83]. Properly designed placebo control illustrated appropriate results . In addition, arguments may be made with regards to local anesthetic being placebo ; however, local anesthetic and steroids both have been shown to exert similar effects in experimental and clinical studies [45-52,68-71,83-88]. The mechanisms of action of epidural steroids and local anesthetics have been discussed in multiple manuscripts [11,40,42-44]. In summary, the evidence shown in this 2-year evaluation of a randomized, active control, double-blind trial demonstrates that caudal epidural injections in patients with post lumbar surgery syndrome with chronic, persistent, low back and/or lower extremity pain provides significant relief. Consequently, selected patients may be offered caudal epidural injections with or without steroids on a long-term basis. The two-year results of this randomized, double-blind, active controlled trial of epidural effectiveness for post lumbar surgery syndrome illustrates 47% of patients receiving local anesthetic and 58% of patients receiving local anesthetic and steroids showed significant improvement in both pain relief and functional status. There was no statistically significant difference in outcome between the 2 groups. However, the data from the successful groups showed improvement in 62% of patients in Group I and 69% of patients in Group II. The authors wish to thank Sekar Edem for assistance in the search of the literature, Tom Prigge, MA for manuscript review, and Tonie M. Hatton and Diane E. Neihoff, transcriptionists, for their assistance in preparation of this manuscript. Corresponding author: Laxmaiah Manchikanti, M.D. 2831 Lone Oak Road, Paducah, Kentucky 42003, Phone: 270-554-8373 Fax: 270-554-8987 E-mail: drlmcom.